Autumn has arrived and here at La Petite Ferme we are filled with anticipation to watch the landscape and vineyards change colour with the seasons. The start of Autumn is also an exciting time in our kitchen as we launch our new menu. You can read more about it below and meet the man behind the menu. School holidays are underway and a visit to La Petite Ferme is highly recommended – whether to stay over with us in our luxurious accommodation, or spending an afternoon or evening savouring the new Autumn menu and our award winning wines. Franschhoek offers so much to do while you are in the area – have a look at our suggested activities below for the ideal family itinerary. We are excited to unveil our new Autumn menu. Head Chef Kyle, Sous Chef Maveer and their talented team have gone out of their way to create some exceptional seasonal offerings. Guests can choose to enjoy the Autumn Menu as a 2 course or 3 course option. Starters on the new menu feature a Duo of Duck, Herbed Buffalo Mozzarella, Baked Camembert, a Smoked Salmon Salad or Soup of the Week. Following this diners can choose from the main courses of Rooibos Honeyed Pork Knuckle, Pulled Lamb, Wild Mushroom Arancini, Pickled Vine Leaf Trout, or Assiette de la Semaine – the plate of the week. For dessert, the Autumn menu offers Pecan Nut Pie, Bourbon Brownie Pumpkin Tart, Saffron Poached Pears or Cake of the Day. For those with slightly less of a sweet tooth, there is also a La Petite Cheese Board. We look forward to welcoming you at our restaurant to experience the new menu. Bookings are also now open for our special Easter lunch - a three course Harvest Table family feast - but spaces are filling up fast. Hurry to make your reservation by calling us on 021 876 3016 or send a mail to reception@lapetiteferme.co.za. Why do you like working at La Petite Ferme? 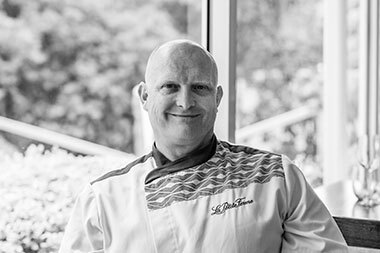 The team all have the same goals in mind on where we want to take La Petite Ferme’s food - and I get the freedom to express myself in my food and plating. I like to focus on keeping things simple, and challenge myself to stay within 5 ingredients or less. I buy the best ingredients that I can find and go from there. Which ingredients do you always have in your fridge and why? Anchovies, pestos, and sun-dried tomatoes – they are perfect to throw together a quick and delicious pasta. Although, I must confess that I seldom cook for myself and love the ready-made macaroni cheese from Woolworths! Which La Petite Ferme wine is your favourite and can you suggest a good food pairing? The Barrel Fermented Chardonnay is definitely my favourite, served with fresh salmon – you can’t go wrong! What is your favourite dish from the new Autumn menu? The wild mushroom Arancini (V) is my favourite. For fun - what is the wackiest/weirdest things you have ever eaten? I have tried some crazy things - raw goat’s testicles, cane rat curry and deep friend tarantula being amongst them. A cheese board is a wonderful way to start or finish off a meal. Putting together the perfect cheese board requires the right balance of flavours and variety. Our La Petite Ferme Cheese Board includes a selection of three carefully chosen cheeses, accompanied by tomato preserve, caramelised walnuts, brioche bread and melba toast. Other favourites include fig preserves, grapes and strawberries – fruit adds a wonderful sweetness to a cheese board. Watch our cheese board assembly video to see how we create it. Follow us on Instagram for more exciting videos from our estate! A great meal is not complete without a great wine to accompany it. 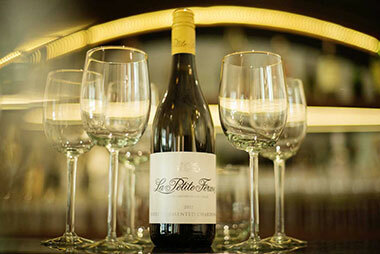 The La Petite Ferme Barrel Fermented Chardonnay, with its fresh and rich citrus, lime and white pear notes, is the perfect choice to pair with our new Autumn menu. Chardonnay is a perfect match with poultry, cheese and fish – making it ideal to marry up with our Autumn starters. Whilst many people believe that meat only pairs with a red wine, the Chardonnay will beautifully complement the main course dishes of Rooibos Honeyed Pork Knuckle, Wild Mushroom Arancini, and the Pickled Vine Leaf Trout. Our accommodation at La Petite Ferme is luxurious and contemporary. Having recently undergone extensive upgrades and refurbishments, our Vineyard Suites - with their phenomenal vistas over the valley, sumptuous décor, private plunge pools, fireplaces, and bathtubs with a view - are highly recommended for a relaxing and reinvigorating break-away. The Provençale Suite is one of our five Vineyard Suites and is possibly the most romantic with its soft powder palette. Think king-sized extra length bed, air-conditioning, a fireplace, mini-bar, smart TV and wireless internet – amongst other things. The bathroom has heated towel rails and under floor heating, a large bathtub and walk-in shower. In addition to all that La Petite Ferme has to offer, the Franschhoek area has a myriad of family-friendly options to keep old and young entertained over the holidays. The Le Bonheur Crocodile Farm is highly recommended for families with young children. Kids can get up close and personal with Nile crocodiles and exotic snakes, plus there is a spacious kiddies’ play area and lawn. The Huguenot Memorial Museum and neighbouring monument, which honour the area’s first French settlers, are also worth visiting whilst in the area. For motor enthusiasts and history buffs, the Franschhoek Motor Museum has an awe-inspiring collection of vintage cars on display. And for those who fancy stretching their legs, the Mont Rochelle Nature Reserve offers hiking trails with views over Franschhoek Valley. There’s so much to experience and explore!